What an amazing opportunity to own this wonderful 2,475 square foot home overlooking Lake Oroville and the East Foothills. This 3 bedroom, 2.5 bath home is complete with large windows and a wonderful front deck to take advantage of one of the best panoramic views of the lake in Kelly Ridge. Only minutes from Bidwell Marina for boating and fishing and not far from town. The large living room, kitchen and dining area all have spectacular views overlooking the lake. The cozy living room has a fireplace and the ceiling is vaulted with wood beams. The kitchen has an abundance of cabinets and granite counters as well as a new cook top recently installed. The master suite has a large walk-in closet and recently remodeled bath with a large jetted tub. Owners refer to the downstairs bedroom as the "dorm bedroom" because of its size and the fact that it can accommodate several beds. This bedroom also has an attached bath that was recently remodeled. The large laundry room has many cabinets for storage and there is also a bonus room with glass doors leading to the backyard deck. The backyard is fenced and the property beyond, which is owned by the State of California, is beautiful with large rock outcroppings. 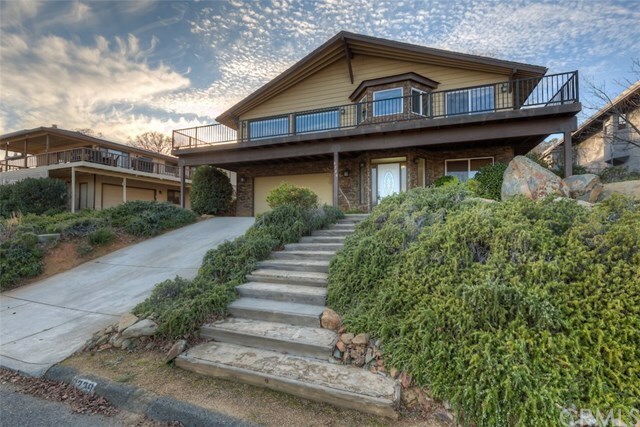 Truly a wonderful home in a great location overlooking Lake Oroville. Directions: Olive Hwy., left on Kelly Ridge Rd., right on Royal Oaks, left on Woodman Dr.